This is arguable one of the most beautiful ideas in quantum physics. To get passed the standard joke, this is not the teleportation one sees in science fiction like Star Trek, where people are transported from one place to another without ever being anywhere in between. Here, we are talking of teleporting information, but very much in the same sense; without ever being anywhere in between. This information is encoded in quantum states, typically on photons. Apart from being fundamentally fascinating, it has practical benefits as well. One of the first was in quantum cryptography – ensuring the security of communication based on quantum physics. How? If you can share a secret between two distant locations, without sending it through something like a fibre optic cable, you could be sure that no one was able to intercept this. While in some systems, teleportation is now simply a tool used to do more complicated tasks, for other, emerging, technologies there remain challenges in preparing and bringing together multiple quantum systems. Nonetheless, whether it be for communication or computation, teleportation plays a key role in many application that promise a quantum advantage, i.e. providing something that can’t be done classically and these will all impact on society, see in particular, the section on secure quantum communication. How does it work? If we look at the above figure, we can walk through the scheme and gain some intuition. At the heart of this operation is entanglement shared between two people – at distant locations – typically referred to as Alice and Bob. One of the cornerstones of what makes quantum technologies so powerful is the fact that one cannot measure this state without Alice and Bob knowing about it – at which point they can try to share some more entanglement. This could be distributed over fibre optics but, for the moment, there is no information here. Now, if someone else wants to send some information to Bob, they can encode this on another state, a qubit, and send this to Alice; again, she cannot measure the state to find out the information. What she can do is make a measurement (a Bell State measurement) – we can think of this in the following way: it compares whether the inputs are the same or different and gives a certain result, still, without revealing any information about the unknown input. Alice sends this result to Bob, which lets him know what measurement he should perform at which time the initial unknown information is revealed – without passing in between Alice and Bob. Bonus point: This does not allow for faster than light communication, as Bob cannot extract this information without the result that Alice sends him, which is classical and can only be sent as fast as the speed of light. Today, teleportation has become a powerful tool that is used on a daily basis in labs all around the world and with some demonstrations in real-world fibre networks. 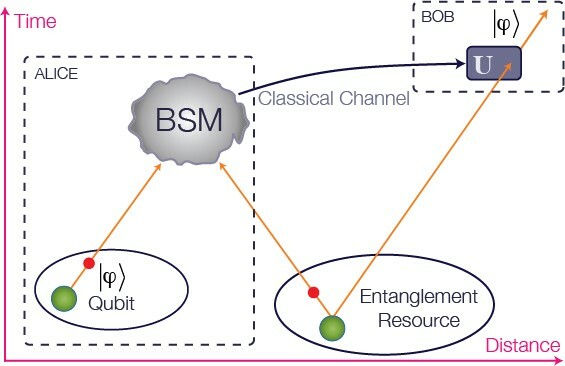 The challenge now is to adapt this to the emerging technologies being pursued for quantum repeaters – to extend the distances over which we can distribute entanglement and quantum resources.